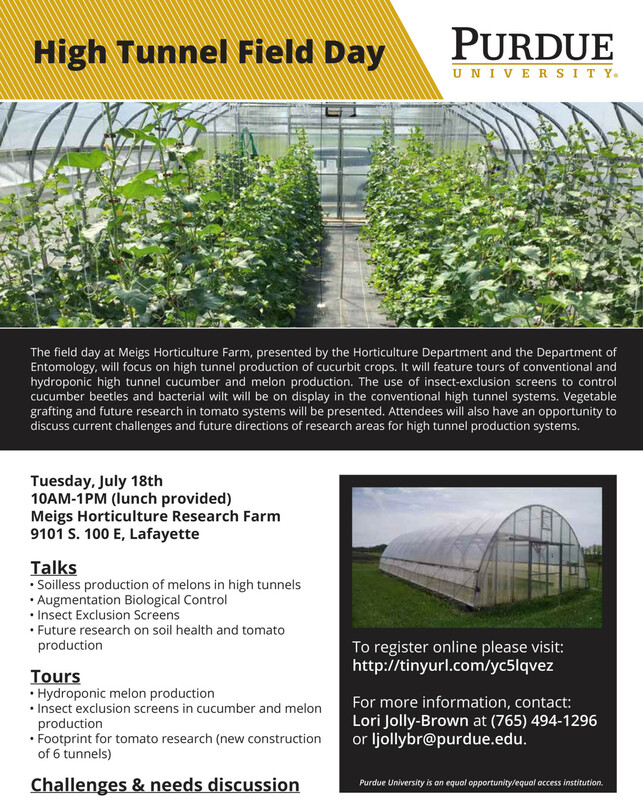 Purdue Extension and Indiana University are collaborating to offer a series of field days featuring high tunnels. The events will be hosted July 18 at the Meigs Horticulture Research Farm in Lafayette; Aug. 10 at the Southwest Purdue Agricultural Center in Vincennes; Aug. 15 at the Pinney Purdue Agricultural Center in Wanatah; and Sept. 27 at the Hamilton County Extension Office and Full Hand Farm in Noblesville. 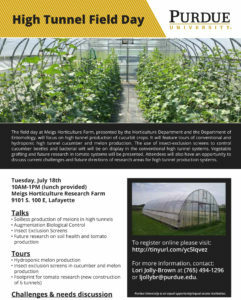 The field day at Meigs Horticulture Farm will focus on high tunnel production of cucurbit crops. It will feature tours of conventional and hydroponic high tunnel cucumber and melon production. The use of insect-exclusion screens to control cucumber beetles and bacterial wilt will be on display in the conventional high tunnel systems. Presentations on vegetable grafting and future research in tomato systems also will be included in the tour. Attendees will also have an opportunity to discuss current challenges and future directions of research areas for high tunnel production systems. Lunch will be provided. During the evening event at Southwest Purdue Agricultural Center, attendees will see demonstrations of soil solarization, end-of-season clearance of soil covers, sprayers used for small-scale plots, and an innovative season-long low tunnel system for growing tomato and pepper. Attendees will also learn how to ID tomato diseases by walking in the field with a plant pathologist. 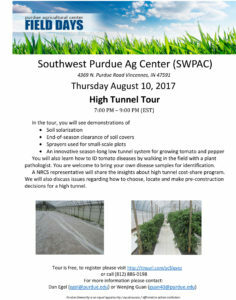 A NRCS representative will share the insights about high tunnel cost-share program. We will also discuss issues relating to how to choose, locate and make pre-construction decisions for a high tunnel. For more information, contact: Kym Schwinkendorf at kschwink@purdue.edu or (219) 386-5232. The field day at Pinney Purdue Agricultural Center will feature tours of tomato production in moveable high tunnels, using both conventional and organic management systems. The event also will include walking tours of sweet corn and pumpkin variety trials, an overview of research findings about the opportunities available through high tunnels, and information about the NRCS program. Attendees will learn about managing pollinators; low-cost high tunnel structures for the home gardener; irrigation solutions; site and structure considerations for new high tunnel users; and finding, preserving and preparing fresh produce. Private applicator recertification credits (PARP) are anticipated. This event includes a dinner and sweet corn variety tasting. This fall event, which is part of the Purdue Beginning Farmer Program, includes educational workshops on top considerations for site and high tunnel structure selection, and advice on managing pests that are common in high tunnels. During an afternoon tour at Full Hand Farm, attendees will observe a successful high tunnel operation that utilizes moveable high tunnel systems. Full Hand Farm is a diverse vegetable farm that produces winter salad greens and a variety of other specialty crops. Lunch will be provided to pre-registrants. Registration is limited.